JAILLOT - Le Comte de Flandre divisé en ses Chastellenies et Balliages &c le Franc de Bruges et le Pays de Waes. . .
JAILLOT, H. / MORTIER, P. - Le Comte de Flandre divisé en ses Chastellenies et Balliages &c le Franc de Bruges et le Pays de Waes. . . 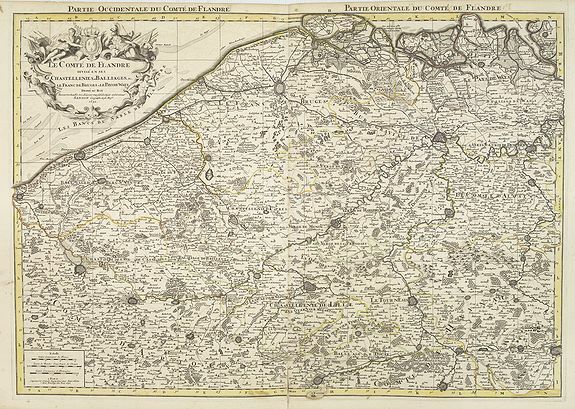 Le Comte de Flandre divisé en ses Chastellenies et Balliages &c le Franc de Bruges et le Pays de Waes. . . - JAILLOT, H. / MORTIER, P.
Title : Le Comte de Flandre divisé en ses Chastellenies et Balliages &c le Franc de Bruges et le Pays de Waes. . ..
Map maker : JAILLOT, H. / MORTIER, P.. Size : 22.2 x 31.7 inches. / 56.5 x 80.5 cm. Description :Fine map of the province of Flanders in present-day Belgium, ornated with a rococo title cartouche with the coat of arms of . Boundaries outlined in hand colour. The map is fully and richly engraved. Three distance scales within cartouches. The map notes Nicolas Sanson as the mapmaker and claims that the map was published by Alexis-Hubert Jaillot (1632-1712). However this plate is from the newly engraved Dutch counterfeited edition of the 'Atlas Nouveau', published by Pieter Mortier in Amsterdam. Pierre Mortier's grandparents left France in about 1625 to live in Leiden. His parents settled in Amsterdam in 1661 or 1662. Pierre Mortier grew up in Amsterdam but lived in Paris from 1681 to about 1685 where he must have gotten into the book trade. Once he was in Amsterdam again he specialized in French books. He established himself in atlases and introduced the modern French maps by Sanson's and Jaillot's in a larger format than the classical Dutch maps. Condition : Printed on 2 sheets joined together. Printed on heavy, somewhat browned paper. Some oxidation of paper due to light offsetting of ink. Good dark impression.